DriverMax supports automated installs, scheduled scans, and full device driver backups. It can be set to check for driver updates and download. One time purchase that cost about $30, and / or subscription that costs between $1 and $23. Price may vary depending on commitment and so on. DriverMax was added by cmateus in Apr 2009 and the latest update was made in Apr 2019. The list of alternatives was updated Feb 2019 There is a history of all activites on DriverMax in our Activity Log. It's possible to update the information on DriverMax or report it as discontinued, duplicated or spam. 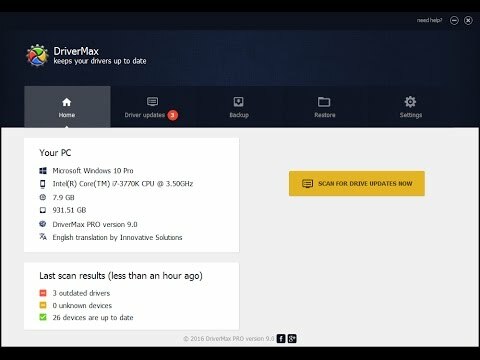 Alternatives to DriverMax for Windows, Web, Linux, Windows S, Steam and more. Filter by license to discover only free or Open Source alternatives. This list contains a total of 25+ apps similar to DriverMax. It suggests officially not existing newer version of intel video driver. Btw driver backup and restore features are available without registration. Any download options require (free) email registration. Driver Max will require you to share the drivers on your system with the 'community' that is upload them to their servers. To download more than 2 drivers a day, you need pro. Handy tool for driver backups, but I'm going to look for an alternative that is completely free. I don't know how well it works, but one thing I can tell for sure is that the free version is really annoying: you need to create an account, you get nag screens all over the place, as "duri" said limited to 2 drivers per day and the interface is just totally counter intuitive. That's not called free software but "nag" software. I can definitely not recommend it for anyone unless you buy the pro version. Great piece of software! Probably still the best one in the market when comes to updating drivers. There's one catch though. Now it has a limitation to 2 driver downloads per day. It's bit irritating. I like this! Better interface then RadarSync and feels a bit better. The only complaint was that you had to register to get a code. But it was worth it.